En solidarité avec les nord-africains déportés et des victimes de la Déportation d´Allemagne. S'il vous plaît veuillez-vous joindre à nous pour une vie décidée par notre quête pour une société libre, l'égalité et la dignité humaine. The German government has been using the increased number of refugees applicant as a pretext to justify the introduction of strict measure on the Asylum and Residence law. The actual draft violates the Fundamental Human Right of refugees, such as health and medical treatment, and abuse on refugees identity and declaration. Lutherstadt Wittenberg: Flüchtlinge Sagen Nein! zur mißbräuchlichen Praxis der Mitarbeiter/in der Auslanderbehörde. Die Mitarbeiter/in der Auslanderbehörde Lutherstadt Wittenberg verweigern mit einer durchtriebenen Praxis den Flüchtlingen ihre Rechte. Read more about Lutherstadt Wittenberg: Flüchtlinge Sagen Nein! zur mißbräuchlichen Praxis der Mitarbeiter/in der Auslanderbehörde. The employee of the Foreign Office of Lutherstadt Wittenberg trickily abuses legal right of refugees. The Foreign Office subjugate refugees to sign document or "Duldung" already prepared without the consent of the refugees. Read more about Lutherstadt Wittenberg: Refugees Say No to the Abusive Practice of the Employee of the Foreign Office. 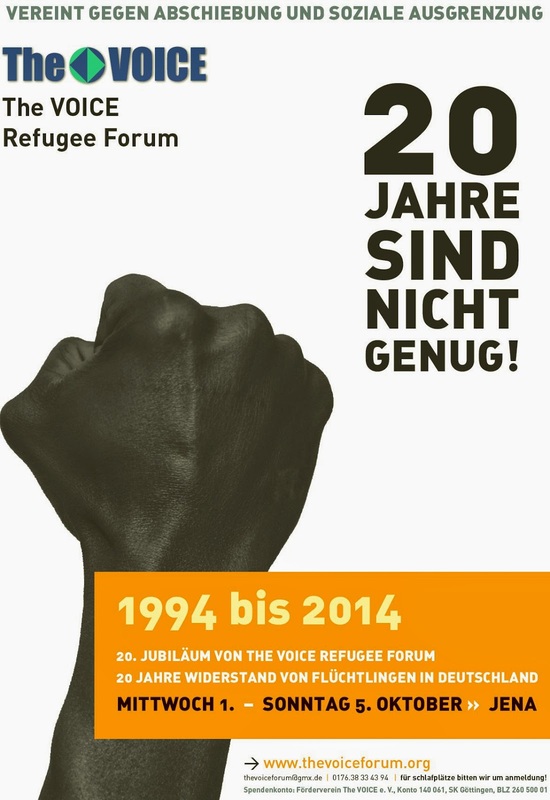 The Citizen's Initiative Vockerode in the local government of Lutherstadt Wittenberg sends a signal that in Vockerode no place for more asylum seekers.¹ Therefore, a demonstration was registered. Read more about Wittenberg: Protect us Now! No Where to Go!